MR. ERNEST Okai, a Kumasi-based journalist, has declared war against crime in the Asafo Electoral Area of Kumasi. He has over the last three years presented streetlights to help illumine all the communities within the Asafo Electoral Area. According to him, he is aware that most of the criminals in the area take advantage of darkness and operate in the night, for which reason he has decided to use his own resources to provide streetlights so that hoodlums cannot operate in the dark. 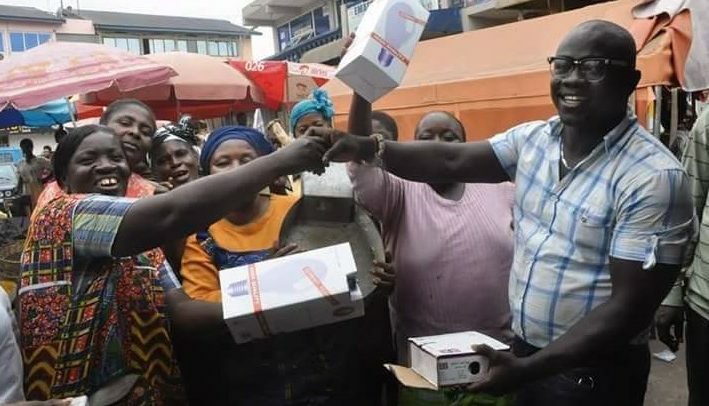 He was speaking when he presented streetlights to traders at Asafo Market during a short and colourful ceremony. Mr. Okai, who is aspiring to become the assemblyman for Asafo, said several communities at Asafo had benefitted from his largesse. He mentioned Moon Light, Asafo BB, VIP Area and Asafo Zion School as some of the communities that had received the streetlights so far. He gave an assurance that he would soon extend his streetlight project to other communities in the area. He was of the view that Asafo would not develop properly if the security of the people is not emphasised, adding that he would sustain his fight against crime. He said he would focus on sanitation, education, health, security and business, just to mention a few, when elected as the assemblyman of the area. He therefore called for total support from residents of Asafo, saying that he was ready to serve and lead them to the Promised Land.